That's good news. But it doesn’t mean we should stop protecting them. Around the world, large predators at the top of their respective food chains are on the move. Recently, animals like alligators, otters, killer whales, mountain lions, and wolves have turned up in new, surprising places. These new habitats, as it turns out, are a lot like their old ones — well, they are their old ones, the ones they occupied before humans dramatically reduced their populations. And that shows that humans have done something right for the environment for once. Large predators may be expanding into their previously-occupied habitats thanks to successful conservation programs, according to new research published in Current Biology. 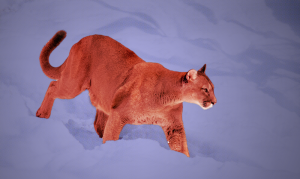 Predators been found in habitats we don’t usually associate with them — mountain lions have turned up in grasslands, sea otters in areas without kelp forests — but these were the environments these species used to inhabit, when their populations were larger. If individuals are now hanging out there, it’s a sign that there are enough of the animals for them to spread out and repopulate those areas. We did it, right? Conservation efforts can cease and we can all go about our lives. Well, maybe we ought to hold off, especially since we live in a world where people look for any excuse to shoot wolves from airplanes and recently stoned a kangaroo to death for not hopping enough. So we can celebrate that previously-threatened animals are returning to pre-human-interference population levels, but let’s also keep the ball rolling. There’s no sign, at least not yet, that apex predators living in broader habitats poses any threat to people, though Quartz mentioned that more people have been bitten by alligators lately. The best part? Letting these animals stay in their new (or original, depending how you look at it) habitats will actually make things easier for the conservationists of the future. The researchers found that many of the ecosystems that animals repopulated became more robust as a result. For example, sea otters who moved to estuaries without any kelp forests feed on crabs that, in turn, feed on slugs that eat algae. Without any otters, crabs had been eating too many of the slugs which let the algae grow rampant and smother local plant life. Solving a problem like that left with our own, blunt, human tools would cost time and money, not to mention the virtual certainty of possibly catastrophic unintended consequences. With predators like the sea otter back in place, some conservation problems are actually taking care of themselves. Environmental Problems Go Hand In Hand With Social Injustice. North Carolina Wants to End That.